Throw away your flimsy flip-flops and treat your feet to comfortable sandals this spring. With Vionic, you’ll find next-level comfort in fashion-forward styles such as Sosha, Dorie, Bella and High Tide. Keep reading to find New 2017 Vionic Spring Sandals that are not only fashionable but also healthy for your feet. 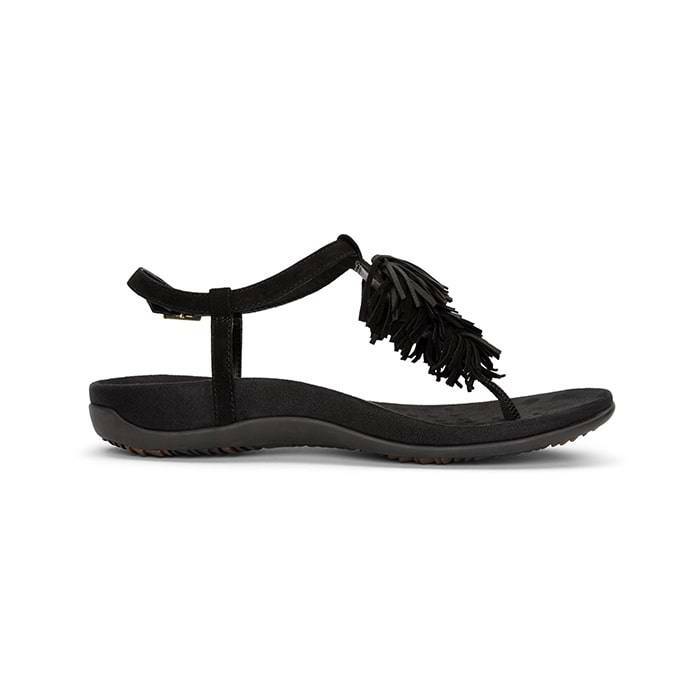 Sosha is a fabulous sandal with a flirty fringed. It is an absolute head turner with the same features you have grown to love from Vionic sandals. For one thing, Sosha’s orthotic-grade footbed promotes natural alignment and supports your feet from the ground up. In addition to comfort, this sandal is a delight to wear for its easy adjustability, all thanks to its ankle strap with buckle closure. Click here to shop all color options in Sosha. 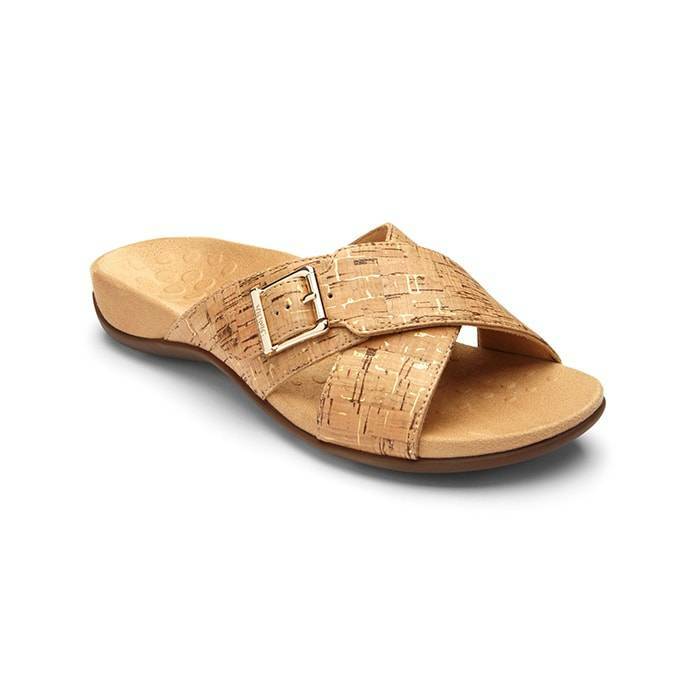 Dorie is a comfortable slide, beautifully designed with two overlapping straps. This comfy slide provides modest coverage but offers all day comfort. 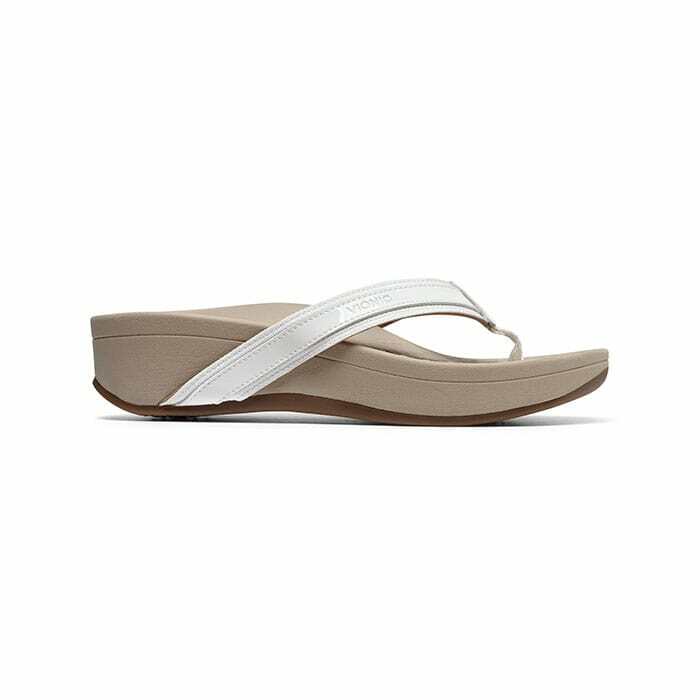 Dorie is a perfect slide sandal that helps relieve common causes of heel pain and knee pain, related to over-pronation and flat feet. Click here to shop all color options in Dorie. 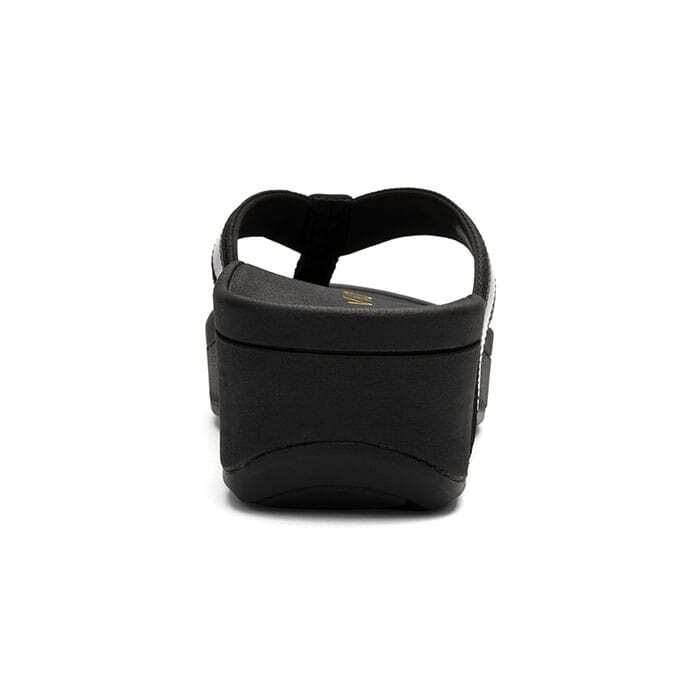 Bella is a popular Vionic sandal with the right support. 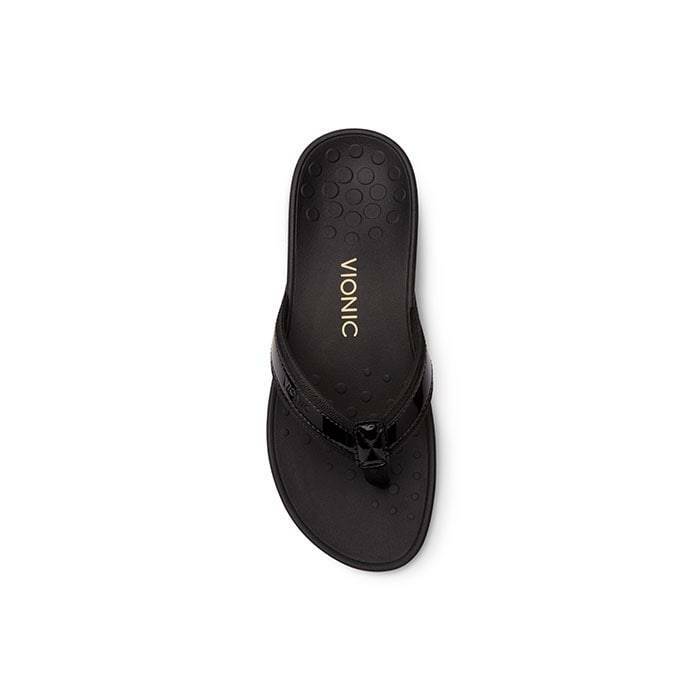 This flip flop has been such a great hit that Vionic keeps introducing new colors, season after season. 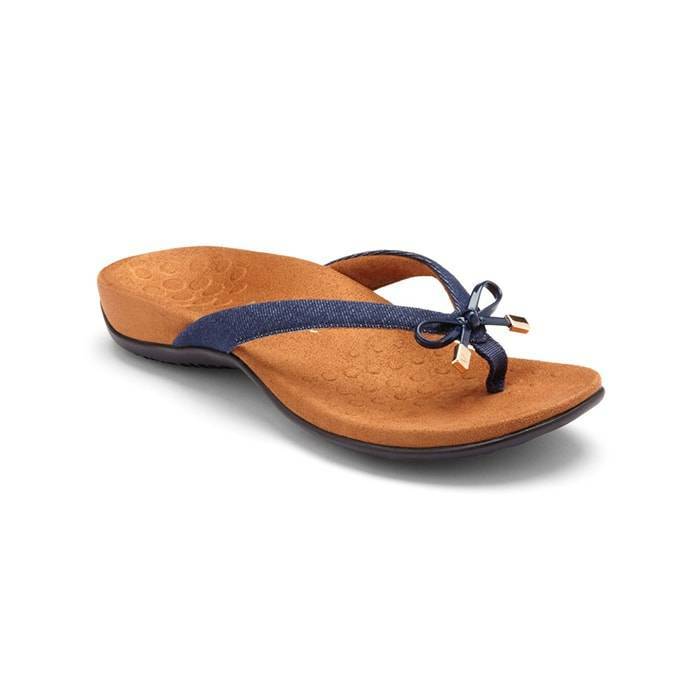 In fact, to add a casual touch to the Bella, they added denim to their color options. In addition, this lightweight thong has an EVA midsole which absorbs shock; thus reducing stress on your feet, ankles, and knees. Click here to shop all color options in Bella. The Vionic High Tide takes their comfortable sandals to new heights. 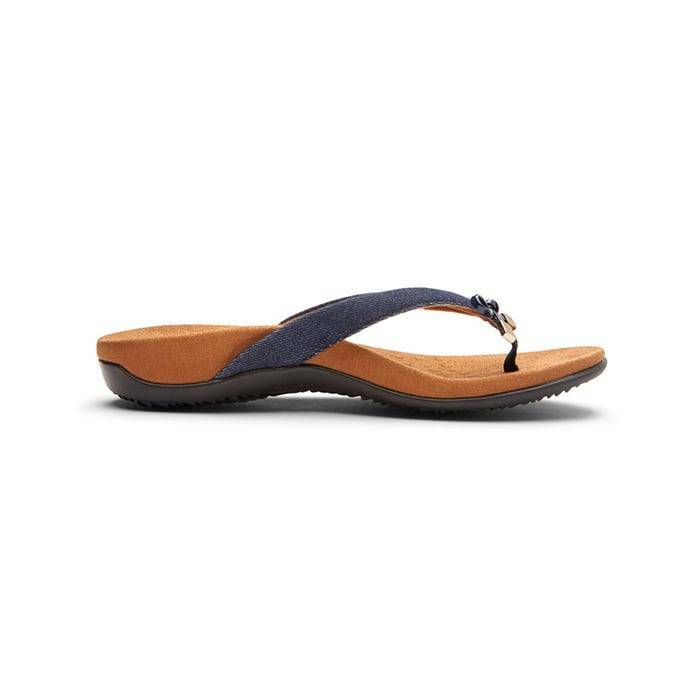 High Tide is a platform thong with an orthotic footbed with arch support to help support and realign feet back to their natural position while wearing them. 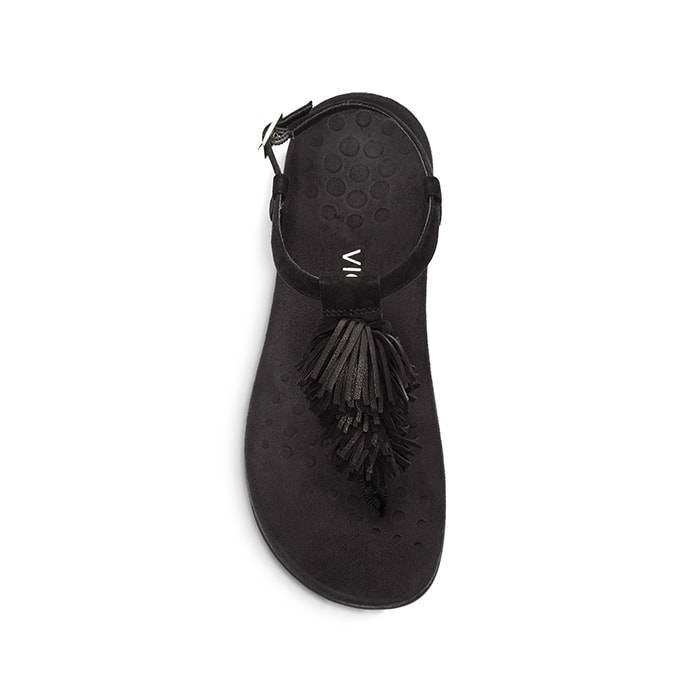 In addition, this wedge sandal features a rubber outsole with wave-patterned tread for traction on a variety of surfaces. Click here to shop all color options in High Tide. 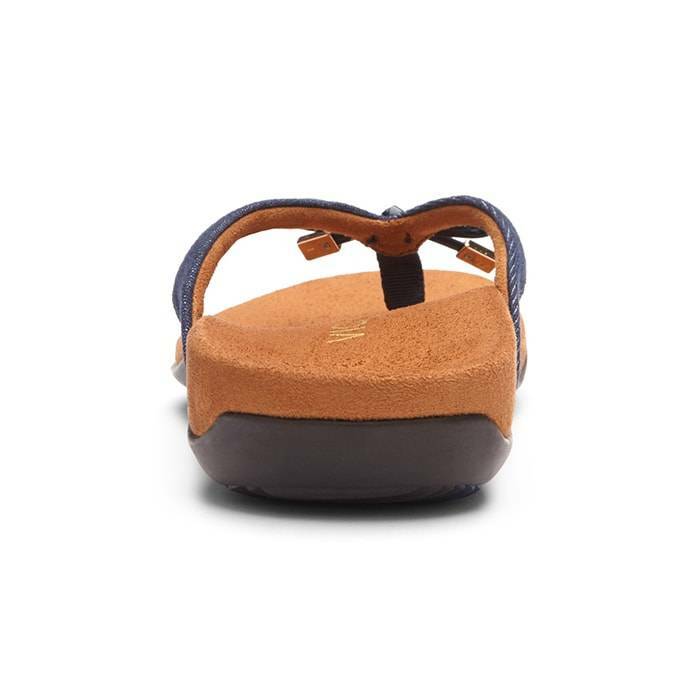 By now, you probably noticed that all sandals (Sosha, Dorie, Bella, and High Tide) have a deep heel cup and a raised inner arch panel on the foot interior area. For this reason, Vionic shoes are made with Orthaheel technology, which brings trusted technology and style in every pair. Their innovative Orthaheel technology is a unique podiatrist-designed contour, built right into every pair of Vionic shoes that promote natural alignment from the ground up. As a result, all Vionic sandals, shoes, and slippers are biomechanically engineered to hug your arches, which support natural alignment. After all, their unique features and technology are what makes them comfortable to walk and stand in. 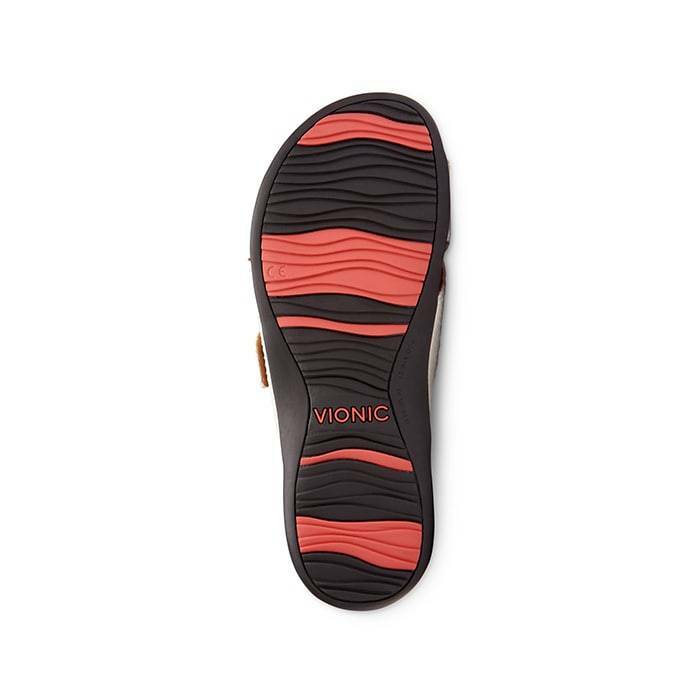 Vionic footwear combines today’s must-have trends with cutting-edge biomechanical technology. Vionic is committed to combining the best of science and style, integrating next-level comfort into fashion-forward styles that women will absolute love to wear. So much that, they have created stylish and comfortable women’s shoes specifically designed to promote an active lifestyle. Vionic believes comfortable shoes equal happy feet. Come into any one of our stores located in Anaheim Hills, Rancho Cucamonga, Riverside, San Dimas, Temecula, La Quinta and Palm Desert! 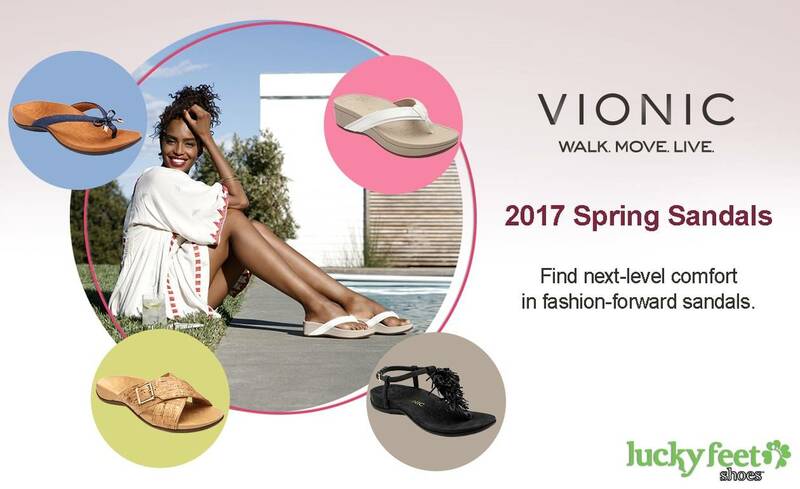 Visit us today so you can try on a pair of New 2017 Vionic Spring Sandals! At Lucky Feet Shoes, we carry many Vionic shoes: sandals, heels, wedges, flats, booties, and boots; in order to provide you with a large selection of comfort shoes. Come and visit us today! If you are looking for Vionic sandals in Anaheim, Anaheim Hills, Yorba Linda, Brea, Orange, Placentia, Costa Mesa, Santa Ana, Fullerton, Irvine, Villa Park or Tustin; then visit our store in Anaheim Hills for your footwear needs. 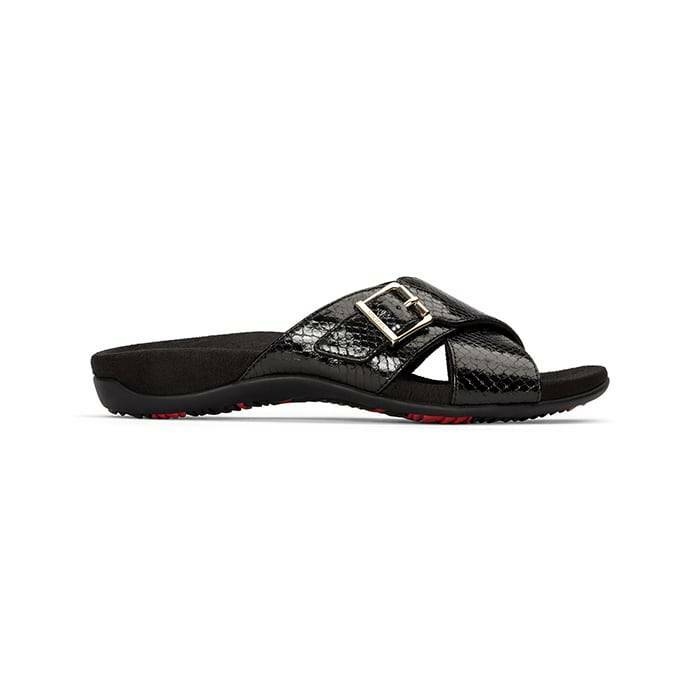 If you are looking for Vionic sandals in San Dimas, Glendora, Pomona, Covina, West Covina, La Verne, Azusa, Diamond Bar or Claremont; then visit our store in San Dimas for your footwear needs. If you are looking for Vionic sandals in Rancho Cucamonga, Ontario, Upland, Fontana, Rialto, Chino, Chino Hills, Mira Loma, Eastvale, Colton or San Bernardino; then visit our store in Rancho Cucamonga for your footwear needs. If you are looking forVionic sandals in Riverside, Moreno Valley, Corona, Rubidoux, Loma Linda, Grand Terrace, Redlands or Norco; then visit our store in Riverside for your footwear needs. If you are looking for Vionic sandals in the Temecula Valley, Murrieta, Fallbrook, Lake Elsinore, Wildomar, Hemet, San Jacinto, Pala, Sun City, Menifee, Canyon Lake, Perris, Bonsall or Anza; then visit our store in Temecula for your footwear needs. 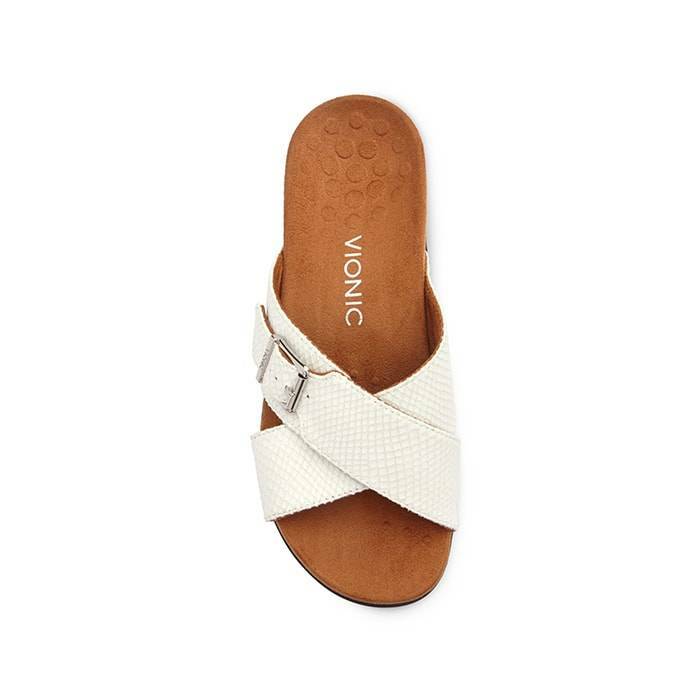 If you are looking for Vionic sandals in Indio, Coachella, Thermal, Vista Santa Rosa, Valerie; then visit our store in La Quinta for your footwear needs. If you are looking for Vionic sandals in Cathedral City, Thousand Palms, Palm Desert, Palm Springs, Desert Springs, Rancho Mirage or Bermuda Dunes; then visit our store in Palm Desert for your footwear needs.